Elizabeth Barrett Browning is possibly best known for her authorship of the forty-four Sonnets from the Portuguese. Five of the sonnets are represented in stained glass in the Austin Moore-Elizabeth Barrett Browning Salon on the third floor of the Library. Together the windows, created by Charles J. Connick Associates, Inc., Boston, Massachusetts, illustrate and convey the story of the courtship of Robert Browning and Elizabeth Barrett. 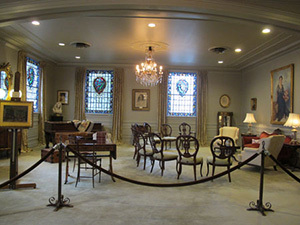 All of the windows, as well as the room itself, were given by Mr. & Mrs. Charles R. Moore in memory of their son, Austin (1907 - 1944), during a dedication ceremony held on 27 May 1951.